1. "Big News Forges Its Own Path." By David Carr, for The New York Times. About how so many major news stories these days find their way into national conversation by way of "asymmetrical journalism." 2. 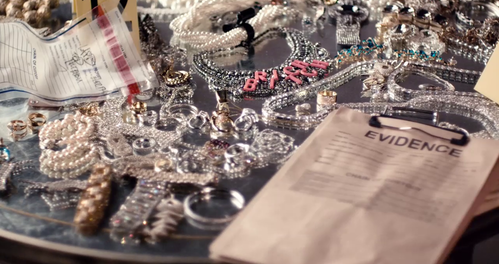 "On The Bling Ring, by Sofia Coppola." Excellent piece by Jake Mulligan of the film blog Rushmore Kite Flying Society, about how Coppola's latest feature documents the overwhelming and now-ingrained narcissism of the social media era. "The saddest scene Sofia Coppola has ever filmed - worse than Scarlett’s Tokyo struggles, worse than the tragedy of Marie Antoinette - comes about 15 minutes into The Bling Ring. Marc, a sexually ambiguous loner type, and Rebecca, the type-A klepto to whom he’s attached himself as admired-follower-supporter, show up to a Hollywood nightclub. They find their friends, wannabe supermodels Nicki (Emma Watson,) Chloe, and Sam; and post up on a not-quite-exclusive couch, where they’re forced to wait an exceptionally long time for their bottle service to arrive. Marc starts singling out celebrities. Nicki texts with Jude Law. Sam and Chloe turn their phones on themselves for pictures. Rebecca sizes up the room. It goes on forever, cutting back and forth, as if words were flowing along with the edits. But there’s no conversation, no trade of ideas, and never once an exchange of affection. For them, for us, now, this is normal. Life lived as a never-ending selfie." 3. 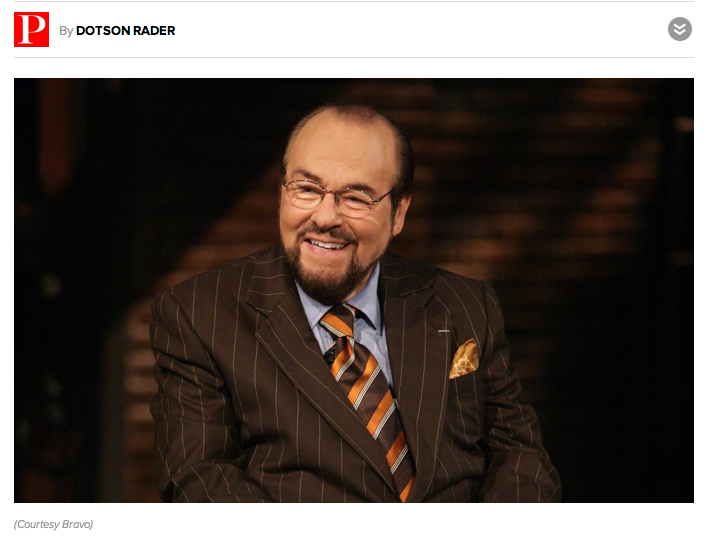 "Inside the Actors Studio Host James Lipton on His Favorite Interview, and Pimping in Paris." By Dotson Rader, for Parade. Apparently Lipton once ran a Parisian bordello, which explains why he speaks such good French. Also, he's 86 years old. Eighty-six! 4. "Actresses Needn't Apply for Roles in Egypt's New All-Male Sitcom." By Summer Said, for The Wall Street Journal. Egyptian Islamists have come up with a more radical solution to the issue of how to censor programs involving scantily-clad women or titillating scenes. Coffee Shop, a TV sitcom to be screened this summer, won’t involve any women actresses at all. "'Everything is about supply and demand and currently there is a demand for this type of cleaner art in our society,' says Taqieddin Abdel Rashid, the deputy head of Al-Hafez television, the Islamist channel which is planning to broadcast the all-male soap. Some may think it a challenge to produce a 15-episode TV comedy show with no female roles. Family life is off mostly off-limits, scenes set in offices, schools or universities would be tricky, and anything to do with courtship or marriage will clearly be impossible. The promoters of Coffee Shop have side-stepped some of the problem by – as the title implies – setting their new drama in one of Egypt’s traditional cafés, which tend to be all-male hangouts." "Lower Manhattan was Truly Terrifying in 1888." The photo, recently reproduced on Gothamist, sure makes it seem that way. 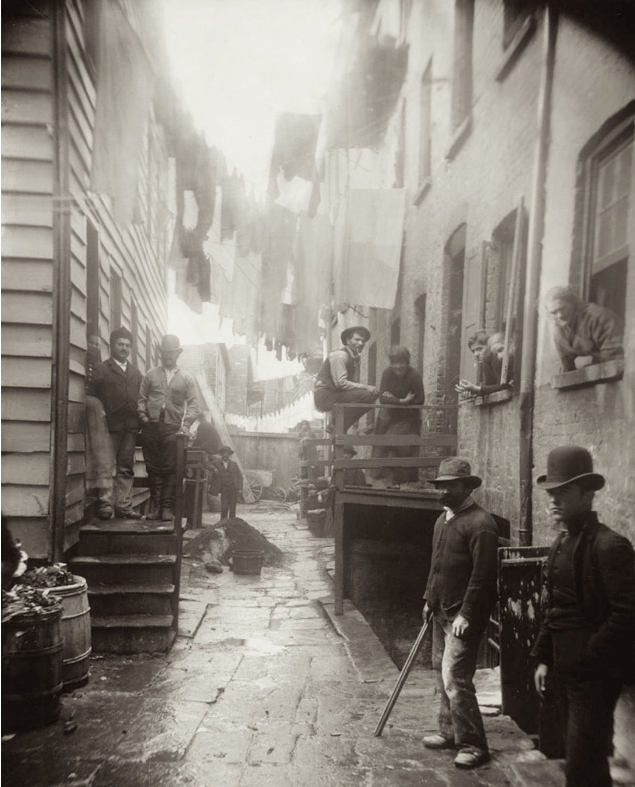 It's taken from Jacob Riis's 1890 classic "How the Other Half Lives," "an early publication...documenting squalid living conditions in New York City slums in the 1880s." You can download the book as a PDF here. "It's easy to romanticize Old New York—but it wasn't always filled with cuddly subway graffiti, goofy beefsteak dinner traditions, and adorable billy club-wielding vigilantes. Back in the late 19th century, parts of Lower Manhattan were crime-ridden cesspools filled with tough looking b'hoys in intimidating bowler hats." "I think we can relate this back to education." -- Miss Utah. As a YouTube commenter noted, "I think the idiocy of her answer is somewhat lessened by the fact that the question was asked﻿ by someone from The Real Housewives."